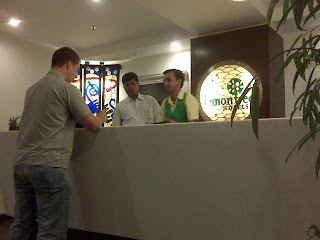 When I visited Chennai, I stayed at a fancy hotel. Even the most simple tasks, such as getting into an elevator, seemed to require the assistance of hotel staff. By the time I left I was looking forward to returning to the US just so I could open doors for myself again. 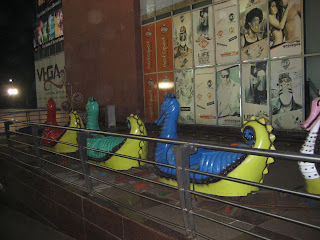 My hotel is on the upper floors of the East Delhi Mall, fun for all ages! The hotel I am staying at in Delhi is very different. It is called the Lemon Tree Hotel. The one I am staying at is located in the East Delhi Mall. It is a decent, European-style hotel. Service is friendly without being effusive. I have no complaints on the hotel. Well, maybe I have one. The hotel staff looks like villains from the old Batman television show. Lemon Tree's gimmick is a lemon-and-lime theme. Their hotel stationary, pencils, bathroom amenities, etc are a shocking shade of yellow and green. Unfortunately, their reception staff's uniforms are also subject to this theme. It is perhaps the most hideous hotel attire I've ever seen.